Windows Mobile 7 aiming for Spring 2010 RTM? Purported release dates for the first crop of WIndows Mobile 7 phones have varied in a surprisingly tight range over the past year, slipping from late '09 to the latest we've heard, late 2010, and the latest info we've got here dovetails nicely with that. 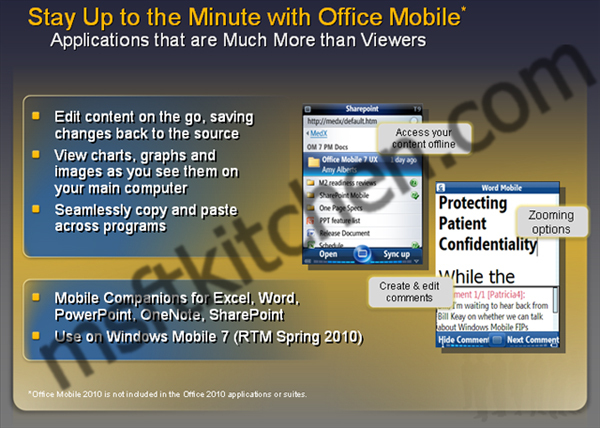 What you're looking at up above is allegedly a slide out of an Office 2010 deck presented to Microsoft partners, where an updated Office Mobile suite is mentioned in passing alongside a WinMo 7 RTM date of Spring 2010. As Mary Jo Foley points out in a comment on the original post, that would put phones on shelves several months later at the earliest, which leads us back to the fact that this actually fits in very well with the Q4 2010 window we've been getting from other sources in recent memory. Though the screenshots on the slide are seemingly new, they match perfectly with the UI paradigm set by those purported WinMo 7 shots we saw nearly two flippin' years ago, which leads us to the obvious question: is the UI basically finalized? And if so, is it going to feel stale by the time it's released some three years after it first leaked? Windows Mobile 7 aiming for Spring 2010 RTM? originally appeared on Engadget Mobile on Fri, 09 Oct 2009 17:41:00 EST. Please see our terms for use of feeds.